Why was Washington Redskins owner Dan Snyder at the Fritz Pollard Alliance dinner, which strives to end structural racism in the NFL? On the Thursday of Super Bowl weekend in New York City, I was a guest at an awards ceremony being staged by the Fritz Pollard Institute, an organization that aims to challenge the NFL to improve racial diversity in the ranks of coaches and general managers. Among those in attendance were heroes of mine, including three people in this photo, Walter Beach, John Wooten and Jim Brown. Then the unexpected took place. Just after the lights slightly dimmed and the program began, Washington Redskins owner Daniel Snyder walked through the door. It was bracing, and not only because this is someone I have written about critically for years, without ever actually seeing face to face (surprisingly fit!). But the shock ran deeper than my own personal feelings. 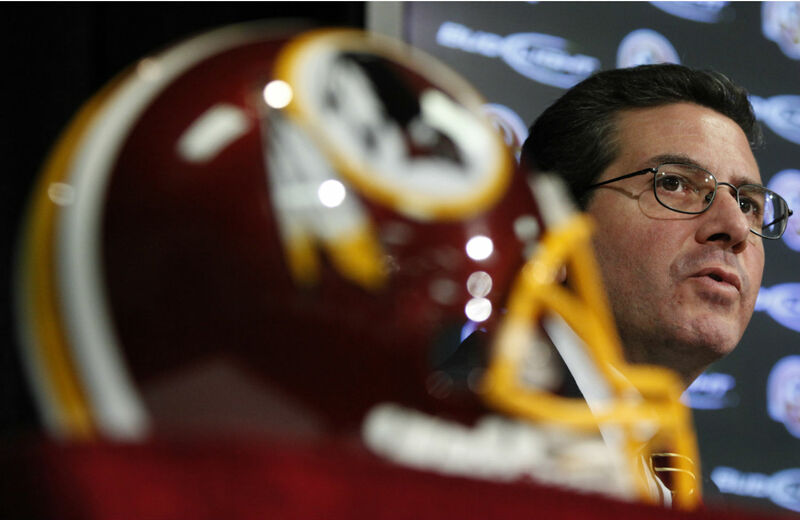 Having Dan Snyder at an event that celebrates minority hiring is like seeing Michele Bachmann at a mosque. The Redskins in their entire history have never hired a full-time African-American head coach* or general manager. Snyder just continued this dismal tradition by making Jay Gruden, a coordinator with a famous name and no head coaching experience in the NFL, his new man in charge. But that is not, of course, the only reason it was a shock to see Snyder. His team has been under relentless fire from Native American organizations, a coalition of civil rights groups and African-American clergy for having a racial slur as their team brand. Snyder has rebuffed every effort to sit down with these groups. Instead, rather than taking the whole “reconciliation” approach, Dan brought in a professional consultant to help manage this crisis. His name is George Allen. That would be the same George Allen who is the brother of team president Bruce Allen—the same George Allen who was known for keeping a noose in his office when running for the US Senate in Virginia to highlight his “tough stance on law-and-order issues,” the same George Allen whose presidential aspirations went up in smoke when he was caught on camera making a bizarre racial slur. Yes, in an effort to keep accusations of racism at bay, Dan Snyder brought in the Macaca guy. Dan Snyder is one of the very few owners (I counted three as well as Commissioner Roger Goodell) who deigned to show up at this event. And good for him. But the question remained: Why would an owner under fire for having a racist name, and with no record of hiring African-Americans to executive or head coaching positions, be at an event to celebrate the movement to hire minority coaches? I wanted to ask him, but alas, he left early while the event was still in progress. Basically, if Dan Snyder believed in racial justice he could stop defending the legacy of the proud, Dixie-playing, Stars and Bars–waving confederate fetishist, George Preston Marshall. I also spoke with Suzan Harjo of the Morningstar Institute, and the Spartacus of the decades-long struggle to change the name, about her thoughts on why Snyder would attend an event like the Fritz Pollard dinner. She said, “It reminds me of Senator Jesse Helms, who used to get funding for the Eastern Band of Cherokee Indians to mask his contempt for African-Americans by showing support for another minority group.” Ouch. The most surreal part of seeing Dan Snyder at this event was that the Fritz Pollard Alliance devoted the heart of the evening to honoring the late Johnnie Cochran, a civil rights attorney best known for representing O.J. Simpson, but also the person whose threats of a class-action lawsuit spurred the first movement toward the NFL’s adopting of “The Rooney Rule,” which mandates that owners must interview coaching candidates of color. Several speakers, in celebrating Mr. Cochran, made reference to his relentless twenty-seven-year effort to get the wrongly convicted Geronimo ji-Jaga Pratt, a Black Panther revolutionary, out of prison for a murder he did not commit. Born Elmer Pratt, Geronimo took the name of the great Native American leader out of respect. It signified Mr. Pratt’s commitment of resistance to people like George Preston Marshall. I could only wonder what Snyder thought every time speakers spoke about Cochran’s efforts to liberate to a man named Geronimo. It was a crash course, if Snyder could hear it, in the difference between honoring a culture and making it into a cruel cartoon. I had a very respectful short speech to say to Mr. Snyder after the event ended but, as mentioned, he left early—and quietly—while the formal program was still in progress. I considered getting up and disrupting the proceedings as he moved toward the door, but this was an event to honor minority head coaches and Mr. Cochran. Their families were in attendance and I had no right to raise hell in those surroundings. I can say that afterward, I learned I wasn’t the only person who had such temptations. There were several of us who gathered and talked about what we would have said if Dan Snyder had stuck around to socialize. We all had different angles and different tones, but it centered around a very basic idea: Dan, if you really care about social justice and aren’t here just for cheap public relations, then you’ll change the name.